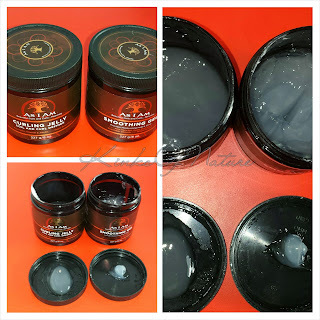 III Sisters of Nature Natural Curling Gelo: The only thing I like about this product is the fragrance. It reminds me of candy or Sprite Remix (if anyone else remembers those delights). That was the only plus for me. Every time I used it, it created a mess in my hair. It's too light to hold my hair on its own, but the Gelo cannot be layered with any other product! Whenever I tried to layer this with my leave-in and oil, it would turn white. I made the mistake of attempting to add another gel on top of the Gelo when I noticed it wasn't providing enough hold. It created this glue-like substance in my hair; I'm talking white balls everywhere! My hair was matted! It was a disaster. Even when I shampooed my hair, the white balls just would not go away. I tried combing them out, brushing them, and nothing worked. I had to disguise and hide that mess under a hat. It took multiple clarifying washes to remove. This product is the reason I test my stylers before applying them to my hair. I will not be a victim again! Someone with a looser pattern might be able to use this on its own. It's a shame this didn't work because I really loved the fragrance. Afroveda Hibiscus Hair Infusion Herbal Hair Oil: I've used this oil as a pre-poo, a scalp oil, an oil rinse, and a sealant. It works well for each purpose. It's a thin oil, that I'm able to apply daily without my hair becoming greasy. I only wash 1 or 2 times each week so I prefer lighter sealants. It has a pleasant light tea fragrance. Unfortunately the formula has changed, and I've just finished my only bottle. I doubt that I'll try the new one because the main ingredient is no longer jojoba oil. Aussie 3Minute Miracle Reconstructor Deep Conditioner (UK Version): Click here for a mini review. Bee Mine BEE•U•Ti•FUL Moisturizing Deep Conditioner: Click here for a full review. Bobeam sample bar: I can't remember which one, but click here for my initial review or here for my updated review on Bobeam bars. Camille Rose Naturals Algae Renew Deep Conditioner: Click here for a full review. This is either the second or third jar I've finished, and it is now on my HG List. Deva Curl One Condition: I liked it initially when I was using it with Deva Curl No Poo, but I noticed that it doesn't work well after a shampoo or when my hair is really dry. It didn't provide enough moisture. I had an old formulation of One Condition, and doubt that I'd try the current one. Eco Natural Argan Oil & Shea Butter Eco-Lesterol: Click here for a full review. Eco Styler Krystal: I used this gel solely for slicking down my edges and making sleek buns. It worked for that purpose, but it also made my hair so hard that restyling or even moving my hair was impossible without re-wetting it. I won't be repurchasing. Koils by Nature Ultra-Moisturizing CocoAloe Deep Conditioner: This was just too light and thin for my hair as a deep conditioner. Whenever I used it, I felt like it needed to be mixed with another deep conditioner or followed by an extremely moisturizing rinse-out. It's ok as a leave-in, but not so great that I would repurchase. ORS Hair Mayonnaise: This has been one of my favorite products since my relaxed days. It moisturizes, softens, and strengthens all in one go! When I purchased my latest one, there were two different formulations on the shelf with the new packaging, but both say "New Look, Same Great Formula".... The one I have has safflower seed oil as the fifth ingredient. If I remember correctly, the other formulation has mineral oil higher on the list than safflower seed oil. I don't know which formulation is currently being produced so I'm hesitant to repurchase and later find out that the formulation I like is discontinued. Shea Moisture Coconut & Hibiscus Curl & Shine Conditioner: Click here for a full review. 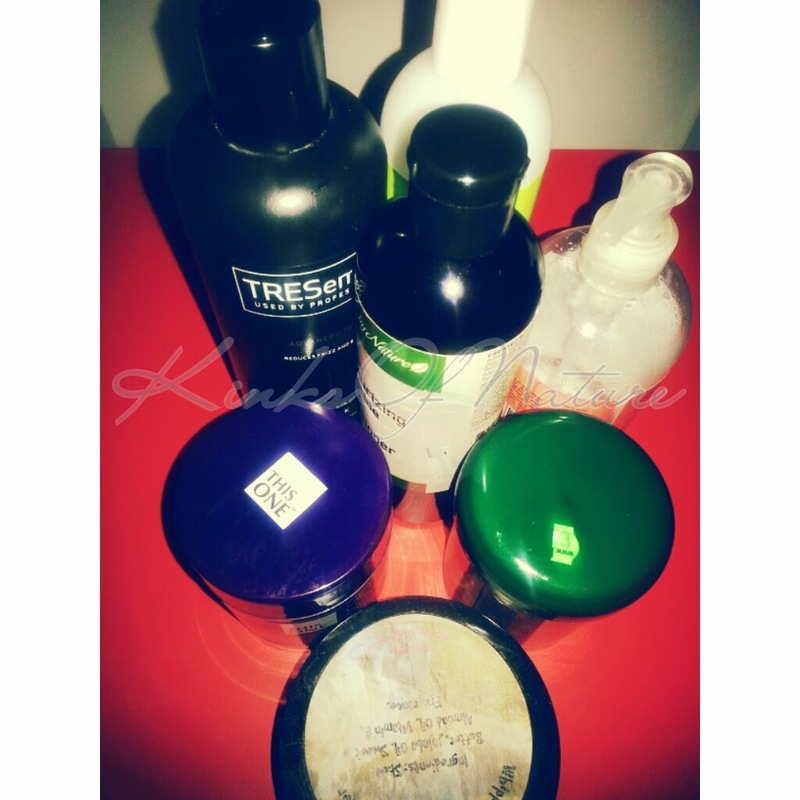 Tasti Kiss Essentials Whipped Shea Hair & Body Butter: I mainly used this on my body. It's a nice shea mix. I preferred Mai Sweet Carla to this one, but it's still nice. I had it in the cinnabun fragrance. I do get a whiff of cinnabun whenever I use this, but scent is completely subjective. Someone did tell told me I smelled like curry when I used this. Now smelling the jar, I can understand and that's killed the cinnabun association for me so all I think of now is curry. I'd repurchase this but in a different fragrance. I have yet to find any firm butter blends that work for me as well as the Tasti Kiss ones. This One Gets Locks Glam Again Replenishing Treatment: This was an unexpected find in Superdrug. It's inexpensive and full of ingredients that a lot of naturals love. The only non-CG-friendly ingredient is isopropyl alcohol, which is midway in the list. I would repurchase this again, preferably while on offer; it's thick and moisturizing, and I know when I use it, my hair will feel good. TRESemme Smooth Salon Silk Shampoo: It's a decent shampoo for clarifying. I didn't love or hate it. I purchased a TRESemme shampoo because for the size and price, it's usually a good bargain. This was the only liquid shampoo I had. Whenever I purchase another one, it will probably be from the TRESemme line but not necessarily the Smooth Shampoo.